An unbeatable opportunity to sample grade 4 rapids on the best of this river. 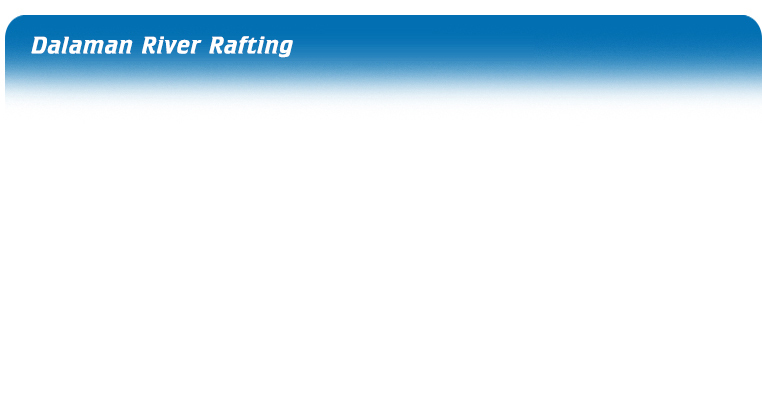 A real adventure rafting through the narrow limestone gorges, surrounded by fragrant pine forest. You have the chance to bathe in natural jacuzzis, swim in shallow pools, jump off rocks and drink from crystal clear springs, as well as the optional experience of wilderness camping by the riverside. A big thanks for the white water rafting day. The arrangements, the transfer, the lunch and of course the time on the water was superb. Please pass on our thanks to the three guys who took us on the day, their enthusiasm through the whole day made the trip even better. A day booked with Alternatif will be top of my list of recommendations for anyone coming to that part of Turkey.
" Thank you for a wonderful weekend. 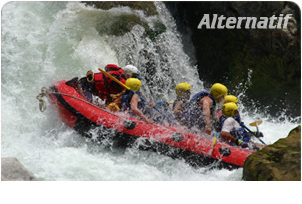 It was perfectly organized, beautiful scenery, very tasty food, enjoyful rafting and very friendly guidance." " My family and I would like to thank you and your team for a fantastic day out on the Dalaman River�.perfect organization and a truly enjoyable experience. Your team�s professional attitude and friendly welcome is to be congratulated." " Thank for very much for the one unforgettable day out on Dalaman Rafting�.everything were organized safe and high qualified." We would like to thank you very much, we had a wonderful trip on Dalaman River�we had a lot of adrenalin and fun! It�s unforgettable! " " I am extremely impressed with your efficiency and friendly professionalism. My sons and I thank you very much for the most exciting day of our holiday, it was really a trip to remember. " " Thank you all for having opened a door for me to a most beautiful, challenging sport. Special thanks for the great spirit and many laughs of the whole team, for the friendship and care of our guides. "